CFINE urgently need long lasting foods- as per the attached poster. Our friends at Inchgarth Community Centre have asked us to help with this appeal. You already know that Inchgarth supports and hosts the TLC foodbank, which does an outstanding job for the people of Garthdee and South Aberdeen as a whole, where many of you have been most kind and dropped items off. I am hoping to tap into your generosity once more for this appeal that shows together, Garthdee organisations, representatives, people and those from city wide services that work with us- truly do care and that we have made a joint impact. After all, isn’t this one of the core reasons we all work together and meet, to meet such challenges head on. 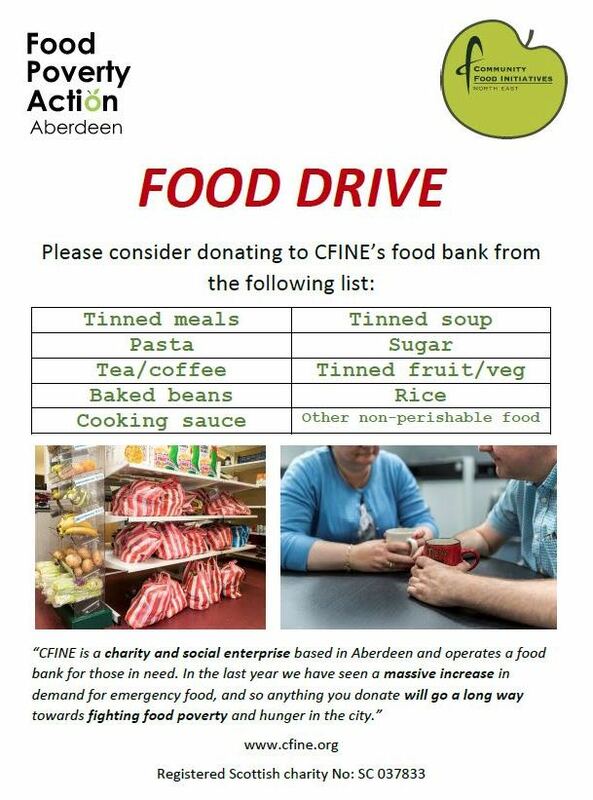 I know you are all really busy, but if you get moment, please do share on all of your social media pages, amongst your colleagues, or nip to Asda or Sainsbury’s in Garthdee, or any other shop, and buy a couple tins of soup, pasta, beans, or any of the items on the list and drop them off at Inchgarth. Thanks so much for your time and efforts on this matter.